Although most investors tout a founder-friendly approach, few follow through on this lofty ambition. This post explains how we at Prime Movers Lab partner with Prime Movers, the creators of breakthrough scientific inventions, to commercialize their technologies and transform billions of lives. Most importantly, we view and treat the founders of our current and potential portfolio companies as customers. This perspective guides every interaction we have, from introduction to diligence to negotiation to building together. Our process focuses on four components: founder, business, technology, and deal. For each step, we work tirelessly to identify learning opportunities and useful connections that can help accelerate a startup’s growth. Our founder-friendly approach starts at our introductory meeting, when we ask Prime Movers “how can we serve you?” and “what is the biggest challenge you need support on?”. In our experience as entrepreneurs, most first VC conversations turn into a pitch and information transfer from founder to investor. We think this is a wasted opportunity because we at Prime Movers Lab are entrepreneurs and can offer valuable advice and introductions for founders. We ensure that in our first conversation, we find ways to add massive value that justifies the precious time founders spend speaking with us. Immediately after this initial conversation, we jump into action to support founders with further feedback, customer introductions, fundraising advice, or whatever else a founder has asked for. We do this for Prime Movers even if we have decided not to pursue further evaluation of an investment, because we are primarily here to help build world-changing companies, and investing is just one component of that mission. We value contributing to founders even if it is not the right time for a financial partnership. We have also designed our diligence process to maximize value creation for Prime Movers such that even if we don’t choose to invest, the startup is in a stronger position for having worked through our evaluation. For the founder-focused portion of our evaluation, we provide actionable coaching and feedback to support personal development in the most critical areas to startup success. Our Partner Decker is a world-leading executive coach who has helped mediate more than a billion dollars of transactions over the past few years while coaching top Silicon Valley CEOs and investors. Decker delivers free coaching to founders in the subjects described below as part of our diligence. Then, after we invest, Decker works weekly with our Prime Movers to support them in their growth as leaders. The only thing that all successful businesses have in common, is that they didn’t give up. Ninety-five percent of startups fail within five years. We seek founders who have demonstrated extraordinary resilience in their personal and professional life. Moreover, building a massive winner requires outstanding energy, passion, and charisma to attract amazing talent, customers, and investors. Decker helps Prime Movers hone their communications to be optimally effective in drawing in and delighting raving fans. 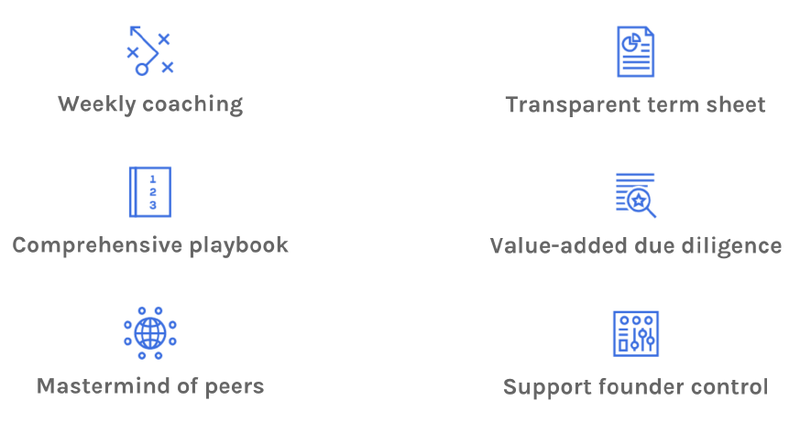 Decker also explores with founders their explicit and implicit values as well as how unconscious patterns may be limiting their personal and professional development. In the process, we examine how enthusiastic founders are to learn, grow, and receive active coaching to maximize their potential and thus their business. The greatest risk in any business is founder psychology and so we start supporting founders, even in the diligence process, to become aware of their opportunities for growth that could catapult their startup forward. For the business-focused portions of our evaluation, we strive to help founders identify new strategies, tactics, and experiments to maximize value creation for their customers. We approach these conversations as brainstorming opportunities to help think through marketing, sales, and customer support processes and we share our learnings from serving some of the world’s largest organizations across energy, transportation, infrastructure, manufacturing, human augmentation, and computing. Our commitment is to unlock so much value in the go-to-market planning during these discussions, that founders say they would have sought the conversation independent of investment. For those companies where we do invest, the support in business strategy and high-value introductions is further amplified. Our Founder and General Partner, Dakin Sloss, who built OpenGov and Tachyus and invested in Boom, meets weekly to partner with Prime Movers and assist them in adapting to customer needs as the business unfolds. Additionally, our Creative Director and Partner, JJ Moi, who has served startups, governments, and Fortune 50 brands, is available to our startups to help with branding, marketing, and product design. His work helps our startups rapidly establish the look, feel, and polish of a mature growth-stage company to impress future hires, clients, and investors at a minimal cost. On the technology side, we perform deeper diligence than most funds and thus typically serve Prime Movers in refining their productization roadmap, IP strategy, and risk mitigation plans. Our CTO and Partner, Ed Moses, previously ran one of the world’s largest nuclear fusion programs at Lawrence Livermore National Labs and has advised dozens of physics-powered startups during his storied career. Our Principal Systems Engineer and Partner, Dan Slomski, has designed everything from particle accelerators to stem cell sorters. Ed, Dan, and a network of dozens of world-leading scientific subject-matter experts with decades of research and development experience dive in with founders to help them evaluate the biggest remaining scientific and engineering risks and low-cost approaches to address them. Additionally, they serve Prime Movers in considering the balance of patent protection and trade secrets to effectively minimize competitive threats. So far, hundreds of founders have received sufficient value from our thorough technical diligence process to justify the time spent with us even when we haven’t invested. After investing, Ed, Dan, and the subject matter experts continue to be available for further brainstorming, design reviews, and technical mentorship. For the deal, we are transparent, just, and flexible. We offer the most founder-friendly term sheet in the market, giving founders maximum control while respecting the basic protective provisions required for a venture investment. We give founders two board seats and ask for one as the lead investor, and we expect to transfer that seat to the Series A lead to maintain founder-control. We also help founders to set up special share classes that give them additional voting rights. Although we are highly active contributors to the Prime Movers we back, we recognize that it is their vision and companies. We are only there to be an extremely supportive partner, never to prevent them from leading where they believe it is best to go. Additionally, we guide founders to establish FF preferred shares with the ability to more easily gain liquidity along the way as their company scales. We want Prime Movers to be incentivized for the long term and to be able to realize the benefits of their success during that journey. Lastly, we reverse archaic provisions such as companies reimbursing VCs for legal fees, and instead we reimburse startups for their legal fees. Legal counsel for the startups we have invested in have unanimously found us to be setting a new standard for founder-friendly negotiation. We go out of our way to help founders understand how to set up the best deal for themselves and the company long-term, even if it might mean a short-term concession from us. After diligence, as mentioned above, we provide two weekly coaching sessions to our founders focused on leadership and business strategy. Beyond that, we are available to our founders for daily text, Slack, and email and serve as their trusted partner. We regularly ask for feedback on what we else we could offer to contribute at an even higher level and add even more value. Already based on that frequent feedback, we have established semi-annual retreats to bring Prime Movers together together to learn from each other and take the time to work on their leadership development. Our Prime Movers also meet bi-weekly in a mastermind to support each other and benefit from peer-to-peer feedback. We also share a proven playbook of sales, marketing, operations, recruiting, and product development strategies and processes with our Prime Movers to accelerate their identification of best practices to adopt. To summarize, at every step in our relationship (introduction, diligence, building together) with Prime Movers, we take a customer-centric founder-friendly approach and ask ourselves “how can we create more value for founders than anyone else”? If you are interested in experiencing what it is like to be a customer, not an investment, contact info@primemoverslab.com to explore how we can serve you.